We pay substantial attention to healthcare in the United States; as a result, we have a mismatch between attention paid to health and our health outcomes. In large part, this mismatch is because we do not pay sufficient attention to the forces that influence health. 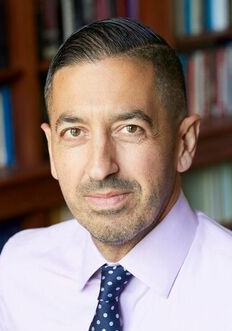 Sandro Galea, a physician, epidemiologist, and author, is Dean and Robert A. Knox Professor at Boston University School of Public Health. He previously held academic and leadership positions at Columbia University, the University of Michigan, and the New York Academy of Medicine. He has published more than 750 scientific journal articles, 50 chapters, and 13 books, and his research has been featured extensively in current periodicals and newspapers. His latest book, Healthier: Fifty Thoughts on the Foundations of Population Health, was published by Oxford University Press in 2017. Fortune Magazine called it “the book everyone interested in health must read.” Dr. Galea holds a medical degree from the University of Toronto and graduate degrees from Harvard University and Columbia University. He also holds an honorary doctorate from the University of Glasgow. Dr. Galea was named one of Time magazine’s epidemiology innovators and has been listed as one of the “World’s Most Influential Scientific Minds.” He is the past president of the Society for Epidemiologic Research and of the Interdisciplinary Association for Population Health Science. He is an elected member of the National Academy of Medicine and the American Epidemiological Society. Dr. Galea has received several lifetime achievement awards, including the Rema Lapouse Award from the American Public Health Association and the Robert S. Laufer Memorial Award from the International Society for Traumatic Stress Studies. He is a regular contributor to, and his work is regularly featured in, a range of public media. There is limited parking on the NIH campus. The closest Metro is Medical Center. NIH Campus shuttle service is available from the metro for NIH employees and visitor. Please allow adequate time for security check. The seminar will be videocast and made available in the NIH Video archives and on the NIMHD website after the seminar. Sign language interpreters will be provided. Individuals with disabilities who need reasonable accommodation to participate should contact Edgar Dews at 301-402-1366 or the Federal Relay at 1-800-877-8339.